Traditional storytelling has been the educational tool for the Navajo people from the beginning. Every time a story is told characters are introduced in a unique perspective. The characters in these stories can include individuals like Spider Woman, Navajo medicine men and women, and one’s own family members, each aiding the main character in times of need. There are cultural lessons to be taught and learned in every Navajo traditional story through beautiful artwork and wonderfully crafted storytelling, especially when told in the Navajo Language. Written by Vee F. Browne. Illustrated by Johnson Yazzie. The story, written in Navajo and English, follows the journey of Cinnibah, a young Navajo maiden who lives in the deep Dinétah. She looks after her widowed father, and every day she grinds corn into flour to make their bread. To do so, she uses a metatean ancient grinding stone that has been passed down in her family for generations. When Cinnibah accidentally shatters the metate, she sets out on a journey to find someone who can help her mend the stone. Her quest brings her to a Moccasin Maker, a Potter, and, finally, the mysterious Stone Cutter. Will he be willing to help her? 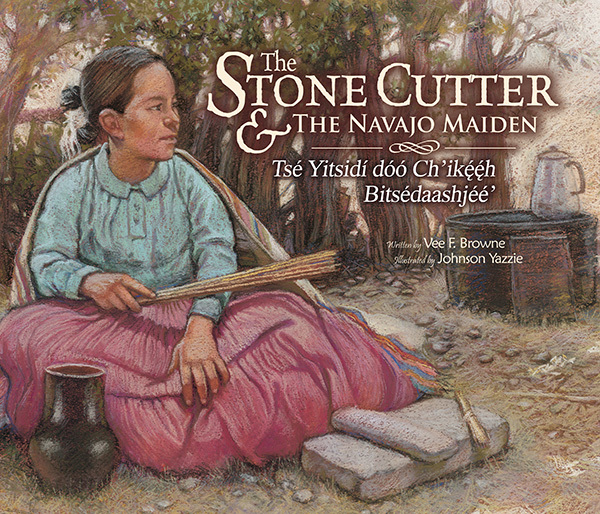 A story about loss and recovery, with strong ties to family and community, The Stone Cutter and the Navajo Maiden is an excellent early reader for both Navajo children and school children in need of learning more about Navajo culture. Written by Patricia Hruby Powell. Illustrated by Kendrick Benally. Navajo by Peter A. Thomas. As fire creeps toward the village of the First People, First Man and First Woman must find a way to quench the flames. First Woman asks the Bird People, the River People, and the Water People for assistance, but everyone she speaks to has an excuse. At last, First Woman asks the mysterious Frog for help. Will he be able to stop the flames before they reach the village? Author Patricia Hruby Powell’s retelling of this Navajo folktale is as graceful as it is compelling, and as magical as the mythical time it describes. Enter the village of the First People … and become a part of the time when the world was new. When the Navajos crops fail yet again, the boy Red Bird is sent to ask Spider Woman for her help. His journey leads him to a flock of sun-yellow birds, a lizard, a Gila monster, and a snake. To each of the animals, Red Bird asks the same question: Could you tell me where Spider Woman lives? At last, after traveling in each of the four directions, Red Bird finds Spider Woman sitting in her web. Will she help him? Red Bird's quest to save his people will serve as an inspiration to all readers with responsibilities that sometimes seem impossible to fulfill. "The quiet tone and spare plot are true to the style of many Native American tales, and this version is not cluttered with modern additions. 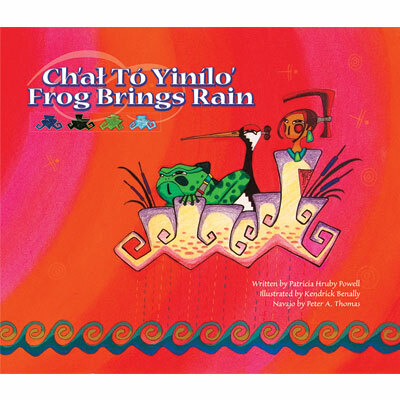 Written in both Navajo and English, the text is gorgeously illustrated. The stylized artwork features rich colors and bold shapes with soft outlines. Both the palette and the lines evoke the Southwest. Using varying and unusual point of view, Benally effectively shows the many shapes of the terrain. The author details her sources well, describing how the Navajo hold their stories sacred. A stunning work." 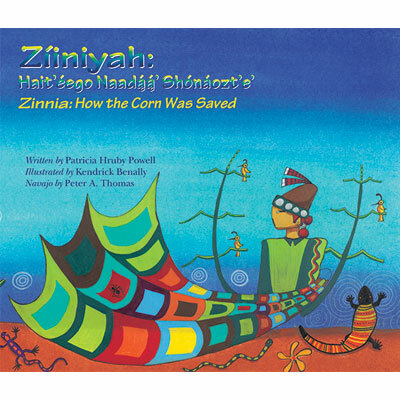 Zinnia: How the Corn Was Saved was awarded the Land of Enchantment Children's Book for 2006-2007.